Building an email list full of engaged and loyal fans is one of the best (and hardest) things you can do for your business . Every website should have some form of email sign up to stay connected with customers. In WordFly you can create a custom subscribe landing page which can either be hosted by WordFly or hosted on your own website. In just a few steps you’ll have your entire subscribe landing page set up and ready to go! First step, customize your WordFly Signup subscribe page options. Follow the steps outlined below to put together the options on your subscribe form. 3. Start customizing your Subscribe options! Select the list you would like new subscribers to be added to. We suggest creating a new list called something like “Website sign ups”. Add or remove form fields, reorganize the fields to display in a specific order, and mark any fields as required. Email address will always be added by default and will be required. Enable preferences for your Subscribe page. Checking this box will pull in any preferences you have set up under Account > Preferences. Learn more about creating preferences! Are you a Tessitura integrated WordFly account? Learn more about setting up preferences in this post! Finalize your subscription confirmation email text. You can customize your subject line, body text and From/Reply to settings for your subscription confirmation email. This is a plain text email that is sent to the subscriber immediately following their subscribe process. Every part of the email is editable. The only required element is the data field ##LINK## which must be present to save the page. 4. Save your Subscribe options. Second step, customize the look of your WordFly Signup subscribe page. Follow the steps outlined below to put your brand into your subscribe form. 2. Select Subscribe Options > Pages. 3. Start customizing your Subscribe landing pages! There are 3 landing pages to customize: Subscribe form, Subscribe Confirmation 1, and Subscribe Confirmation 2. The brown "Subscribe" banner image can be removed and replaced with your own banner image on any of the pages. Add a Content Theme or Background Theme to complete the customized look-and-feel of your pages. For help on using Themes, check the Email Design section of the Support site. Any edits for form fields should be made under Account > Subscribe Options. 4. Be sure to click "Save Template" to save your changes. 5. 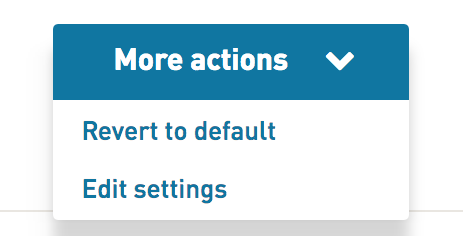 To go back to the WordFly default design, select Revert to Default in the More Actions menu. 6. Select “Save and Publish” at the end of this page to enable your subscribe landing page. Third step, publish your WordFly Signup subscribe page. 2. Select Subscribe Options Settings. Option 1: Copy the “Link to your subscribe form”. Use this URL on your website or emails to direct people to your sign up form. Note: You can use HTTPS for the link if you prefer. 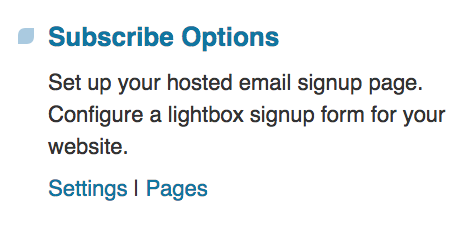 Option 2: Or host the subscribe form on your website. Click “view the HTML” to copy the HTML needed for the subscribe form to work on your website. Once the subscribe pages are live on your website any new sign-ups will go into the list you assigned for the subscribe page. Subscriber’s already signed up on this list they will appear as a duplicate import, but even if a subscriber is a duplicate WordFly will save any preference changes on their record during a subsequent sign up. How can I test the WordFly Signup subscribe form before putting it on my site? You can use the link for your site to test your subscribe form before making it publicly accessible to your customers. 3. Copy the “Link to your subscribe form” at the top of the page. 4. Load this link in your browser to test the subscribe process. The subscribe pages must have a ‘Save and Publish’ date stamp to be live with your changes. Read more about our subscribe best practices on our blog. If I use a CRM for managing my subscribers, what email sign up form should I use? When possible, it's better to use a sign up form that sends new signups into your CRM. For example, our Tessitura and Centaman integrated customers should consider an integrated email sign up form. This would be custom built by your in-house website development teams with the appropriate API calls back to your CRM database. This is the best approach because it creates an account in your CRM system for the subscriber. Subscriber management is easier when you keep all the relationship management within one system. Requires sending separate emails to WordFly sign up list and CRM list. Segmentation would be required to ensure you are suppressing subscribers from receiving emails twice across both emails subscribers in two databases. Extra effort for CRM integrated users. The WordFly subscription does not go back to your CRM; however accounts can become sync'd once a record is created in the CRM with the same email address. Added bonus for Tessitura integrated customers: WordFly can send preference updates back to Tessitura from the subscribe page when there is a customer number (CrmSubscriberID) already logged in WordFly for the subscriber record. Organizations must be using our preferences integration for this to happen. Learn more.